This past March, 225 UI students lent their time and talents to people in need nationwide. Instead of relaxation, 16 Hawkeye Service Teams spent their spring break supporting underserved populations across the country. 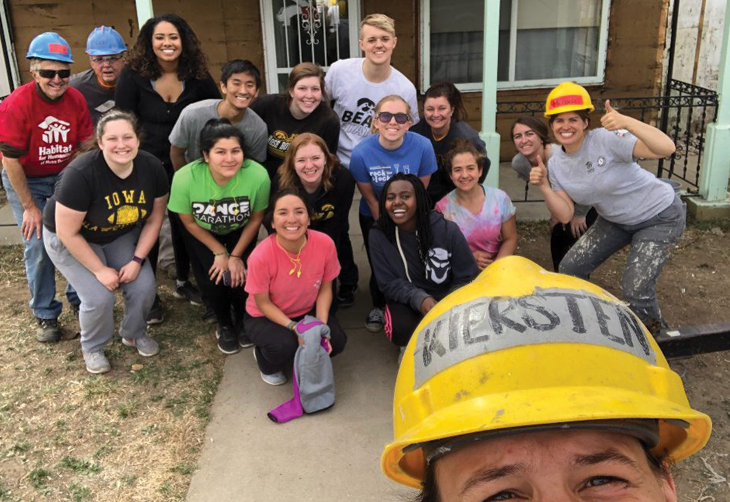 The trips—listed below—are part of the UI Leadership & Service Programs' year-round efforts to promote service learning, social justice, and community building. Community initiative: Supported organizations addressing youth homelessness, AIDS, substance abuse, and transgender issues. "Instead of being embraced with open arms, they were kicked out of their homes." Community initiative: Partnered with an agency that provides economic security for women through affordable child care and job training. Community initiative: Worked with organizations that address the needs of "at-hope" students who walk the fine line between school suspension and incarceration. Community initiatives: Served a children's hospital, a child care center at a homeless shelter, and a domestic violence shelter. Community initiatives: Served at a food pantry, a shelter for HIV-affected individuals, and at a nonprofit for families affected by tobacco and alcohol abuse. Community initiative: Sixteen UI minority students from the the Young, Gifted, and Black Living Learning Community; Hubbard Scholars; and Sista Speak created community with others who have experienced similar struggles. Community initiative: UI students from underrepresented populations worked with elementary schools largely composed of low-income and minority students. Community initiative: Explored business concepts by serving with and learning from nonprofits. To learn more about the Hawkeye Service Teams, visit leadandserve.uiowa.edu/programs/service-teams. Hawkeyes prepare for 24 hours of giving to make an impact at the UI. Three UI entrepreneurs created Students Care, a nonprofit that's removing barriers for those with disabilities. A class takes aspiring therapists and counselors to Greece to explore the history of humanistic counseling. The Hawkeyes' heartwarming gesture inspires three friends to help Iowa's children.